Another exquisite view of the Luxor Hotel and Casino. With fireworks in the background this nighttime view is breathtaking. 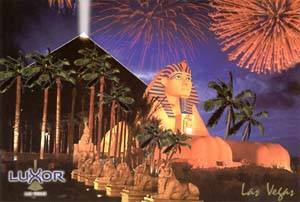 The Luxor Hotel and Casino is one of the many wonderful attractions in Las Vegas. Postcard size is 6 inches by 9 inches. Minimum order is 10, Free USA shipping on all quantities of 10-10,000. Orders processed within 48-hours and shipped First Class mail. Retail price per postcard is $2.50.